FERRARIO -[ Kamchatka men making fire ]. FERRARIO, G. - [ Kamchatka men making fire ]. [ Kamchatka men making fire ]. - FERRARIO, G.
Title : [ Kamchatka men making fire ].. 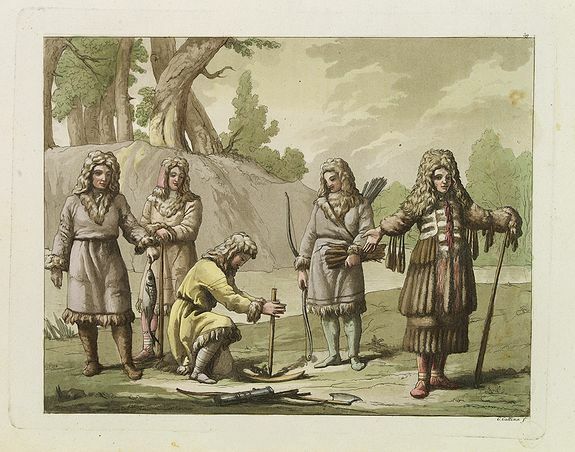 Description :Aquatint depicting Kamchatka men making fire, engraved by D.K. Bonatti, after drawings by C. Bottigella of a family of Turkestan. The territory of the Kamchatka area and all Kamchatka is one of the richest in the world on natural and recreational resources. The Koryaks are the main population of the northern Kamchatka part. The Tungsens ancestors having come to Kamchatka changed their traditional occupation hunting for reindeer breeding. Complete set of a man's wear consisted of a short knee-reaching reindeer parka with running down lapels, trousers, a chest apron put on the parka, knee protectors, fur stockings and boots made of reindeer led skin with soles of bearded seal skin. Plate N° 39.